The “Il Falcone” farmstay sits proudly on the rolling hills of Suvereto, in the heart of the Maremma in Tuscany, just a few minutes from the wonderful sea of the Etruscan Coast. 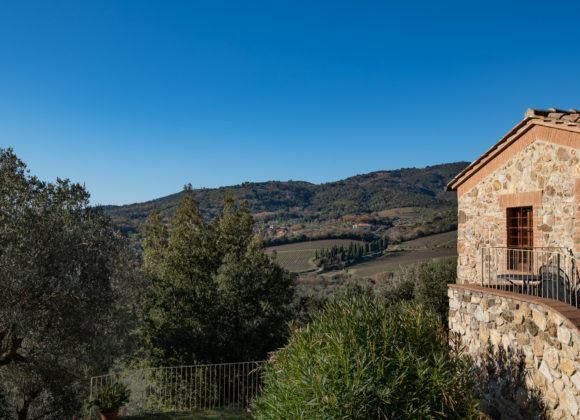 The old farmhouse, surrounded by centuries-old olive trees, enjoys a truly charming setting with spectacular uninterrupted views of the Tuscan countryside. From its hill-top position, you can see the small medieval town of Suvereto, the pretty village of Belvedere, Montecalvi and the sea of the Etruscan Coast. It is the Ideal destination for those in search of a peaceful place to spend their holidays in complete relaxation surrounded by unspoilt nature. The beauty of the Il Falcone farmstay lies in its uniqueness and in the close-knit connection with history and the local area. The apartments are arranged over two farmhouses, “Casetta del Pastore” (The Shepherd’s House) and “Casa dei Contadini” (The Farmers’ House), which were completely restored in 2002 while still retaining the original name and structure. The Farmhouse “Casetta del Pastore” houses two apartments and enjoys a position slightly away from the heart of the farmstay, thus making it great for those in search of total privacy and tranquillity. The Farmhouse owes its name to the key role it played in the 1950s when it would become home to shepherds who came to Tuscany to allow their flocks to graze and would stay for several months at the Falcone estate. With the restoration in 2002, the farmhouse was returned to its former glory, keeping intact its original features: stone walls, exposed beams and terracotta floors, even the windows, the lights and the internal arrangement of the apartments has remained the same. Staying in the “Casetta del Pastore” will take you back in time: sit at the table on the terrace of the apartments, close your eyes and let yourself be carried away by the scents and sounds of the Suvereto countryside blessed with its ancient history. The farmhouse “Casa dei Contadini” is the first to greet you when you arrive at the farmstay. It houses 6 apartments: 4 two-bedroom apartments (two of which have access and facilities for disabled guests) and 2 one-bedroom apartments. As the name says, the farmhouse was once lived in by farmers who used to work the farmland and its structure has been preserved just as it was in the 1950s. Restoration work back in 2002 breathed new life into the farmhouse, without modifying its structure, which still includes its stone walls, terracotta floors and ceilings with characteristic Tuscan beams. In front of the farmhouse, today covered by a lush lawn, there was once a farmyard which serves as inspiration for the name of one of the apartments: “Lo Stollo”, a support pole around which straw or hay was piled up. At Il Falcone we truly love our land and our origins, and for this reason we try to maintain and pass on the link with the past, by also sharing the history of a place very dear to us with our guests. The restoration work resulted in the creation of 8 apartments (4 one-bedroom and 4 two-bedroom apartments) for couples, families or small groups, from 2 to 4-5 persons. 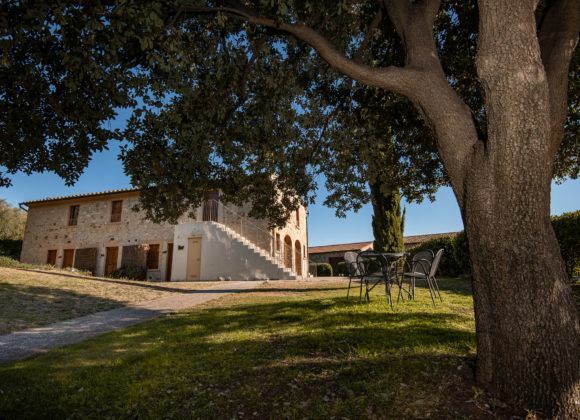 The apartments are furnished in typical Tuscan style and all have an outdoor area, central heating, air conditioning and windows with mosquito nets. Each apartment has a private bathroom with shower and hairdryer and the two-bedroom apartments are specially equipped to accommodate disabled guests. In the garden surrounding the two farmhouses there are two barbecue areas to spend pleasant evenings in the open air. Wi-Fi is available in all apartments and outdoor areas of the farmstay such as the swimming pool, playground and garden. At Il Falcone you will be able to enjoy a holiday that will take on a journey to discover the scents, colours and traditions of old. In a panoramic position nestled among the centuries-old olive trees, you will find the heated swimming pool surrounded by a green lawn decked out with sun loungers and parasols for guests to enjoy hours of complete relaxation while admiring a unique view: your gaze from the pool gets lost on the horizon, out towards the Tuscan hills and the clear blue sea along the Etruscan Coast. Il Falcone is ideal not only for couples seeking privacy and relaxation but also for families with children who can have fun in complete safety in the large playground set amongst the olive grove, just behind the pool. During your stay do not miss the opportunity to visit and let your children discover the open-air museum dedicated to farming tools, located near the vineyards, where you can take a visual trip through the history of the agricultural machinery used over the last 100 years in Tuscany. Then, there is the Botanical Garden where typical vegetables used in traditional Tuscan cuisine are grown. The estate has trails that snake through the vineyards and the olive grove where you can go mountain biking and trekking, as well as short walks for families with small children. Lovers of food and wine will have the chance to take advantage of the tasting hall to sample the wines and oil produced by the farming business.